Nestled in the middle of the Garden District stands this turquoise and white Victorian fantasy of a building, complete with turrets, columns, and gingerbread. Since 1880, Commander’s Palace has been a New Orleans landmark known for the award-winning quality of its food and many spacious dining rooms. The history of this famous restaurant offers a glimpse into New Orleans’ antebellum past. In the early 1880’s, when Louisiana officially joined the nation, eager young Anglo-Saxons flocked to this promising territory to make their fortunes. Since the Vieux Carré was the stronghold of the proud Creoles, these “Americans” (as they were defined by the Creoles) sought a residential section of their own. Thus was born the Garden District, with its stately Greek Revival homes and quiet, tree lined streets. Emile Commander established the only restaurant patronized by the distinguished neighborhood families. He chose the corner of Washington Avenue and Coliseum Street, a site that had been in turn, part of the J.F.E. Livaudais Plantation and the faubourg of Lafayette. In 1854 it was engulfed by the city of New Orleans and by 1900 Commander’s Palace was attracting gourmets from all over the world. 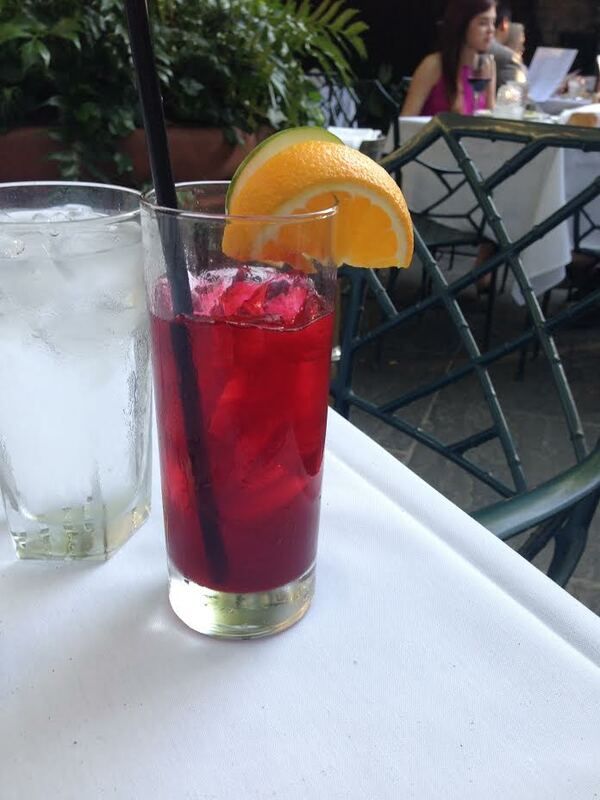 Cucumber cooler with hibiscus tea – very refreshing. The boyfriend got a vodka collins which he enjoyed too. 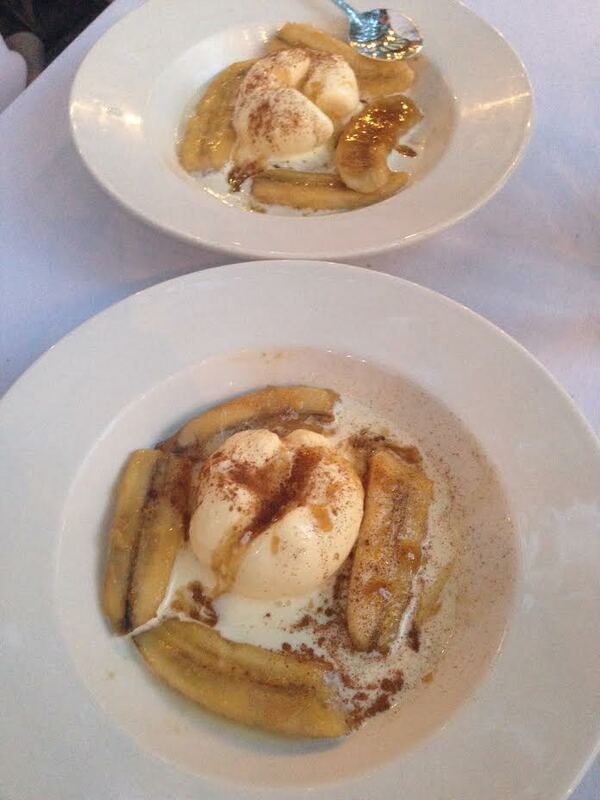 We started with the Commander’s Crisp Romaine Salad (not pictured) which was absolutely divine. One of the best salads I’ve ever had. It includes hearts of romaine, grated parmesan, pressed egg, house made bacon, french bread croutons, shaved gruyere and creamy black pepper dressing. The boyfriend got the famous shrimp and grits. 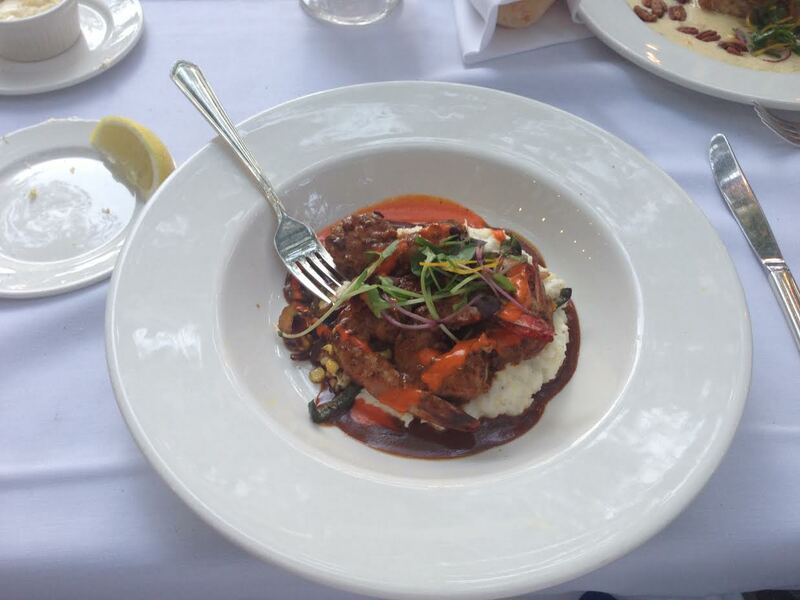 Served with fire roasted chilies, corn, charred tomatoes, caramelized onions over creamy goat cheese thyme grits. He said they were the best ever and they were quite delish! I opted for the Pecan Crusted Gulf Fish. It has been on the menu since the opening of Commander’s. 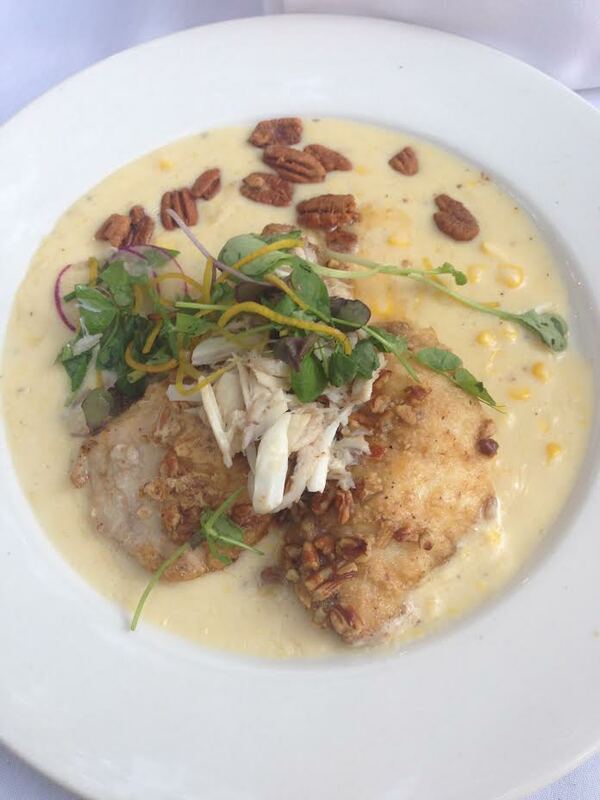 It includes crushed sweet corn, spiced pecans, petite herbs, and Prosecco poached Louisiana blue crab. 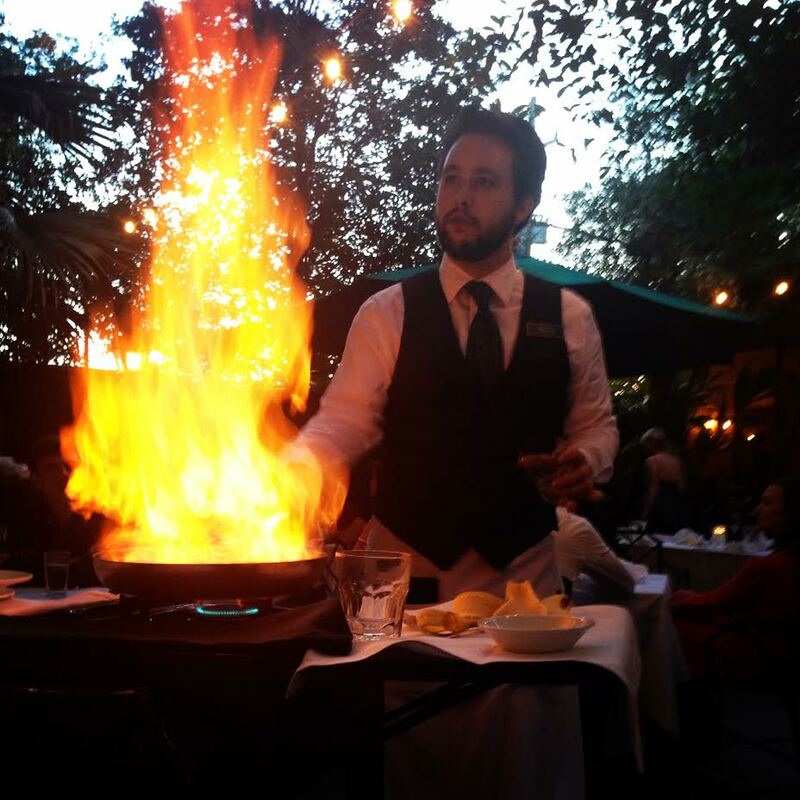 Choosing a dessert is a difficult task at Commander’s, but we chose the table side banana’s foster, because who doesn’t love a nice boozy fire?